The North Carolina Guardianship Manual discusses the role and responsibilities of attorneys appointed to represent allegedly incapacitated respondents in adult guardianship proceedings. 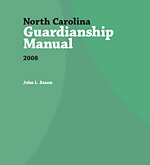 It summarizes and analyzes relevant provisions of North Carolina's guardianship law (Chapter 35A of the North Carolina General Statutes); discusses the legal consequences of guardianship and the relationship between adult guardianship and other laws regarding mental incapacity; jurisdiction, procedure, and evidentiary issues in adult guardianship proceedings; the legal standards for determining incapacity in adult guardianship proceedings; clinical assessment of cognitive and functional incapacity in adult guardianship proceedings; appointment of guardians for incapacitated adults; mediation of adult guardianship cases; appeals in adult guardianship proceedings; and modification and termination of adult guardianship. This is the first edition of the manual. It is available for purchase as a soft-bound book here. John L. Saxon was a Professor of Public Law and Government at the School of Government. He joined the faculty in 1992, and his areas of interest included social services law, child support, elder law, and family policy. Prior to this appointment, he worked for 15 years as an attorney for the U.S. Senate and the U.S. Department of the Interior, and as a legal services lawyer in South Carolina, Virginia, and North Carolina. He is the editor of North Carolina Legislation 1997 and North Carolina Legislation 1998, is co-author of The Law and the Elderly in North Carolina, and has written numerous articles and bulletins on welfare reform, social services, child support, and elder law. He retired from the School of Government in 2010.